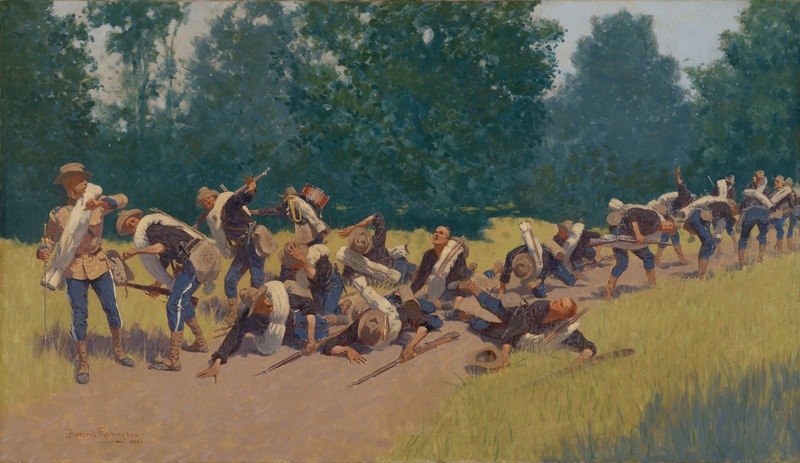 The Scream of Shrapnel at San Juan Hill, 1898, oil on canvas by American painter Frederic Remington (1861–1909). Image courtesy of the Yale University Art Gallery. Crane was the coolest man, whether army officer or civilian, that I saw under fire at any time during the war. He was most annoyingly cool, with the assurance of a fatalist. . . . The fire from the enemy was so heavy that only one troop along the entire line of the hills was returning it, and all the rest of our men were lying down. General [Leonard] Wood, who was then colonel of the Rough Riders, and I were lying on our elbows at Crane’s feet, and Wood ordered him also to lie down. Crane pretended not to hear, and moved farther away, still peering over the hill with the same interested expression. Wood told him for the second time that if he did not lie down he would be killed, but Crane paid no attention. So, in order to make him take shelter, I told him he was trying to impress us with his courage and that if he thought he was making me feel badly by walking about, he might as well sit down. As soon as I told him he was trying to impress us with his courage, he dropped on his knees, as I had hoped he would, and we breathed again. Twenty-five men were making a road out of a path up the hillside. The light batteries in the rear were impatient to advance, but first must be done all that digging and smoothing which gains no incrusted medals from war. . . . If you don't see the full selection below, click here (PDF) or click here (Google Docs) to read it—free! A great account! Stephen Crane describes vividly and luridly the horror, pain ,helplessness and desolation of war: makes one understand why there should be NO WAR in this world.The Martins, the Nolans die and become fodder for the cannons. But the thought that the "dread and lurid" situation might become stuff of a stirring legend,and also the belief that one is fighting in a "famous" war might help, to some extent, in psychologically uplifting and comforting the lost individual. This is an awesome short story! One of the best dialogues are between Martin and Grierson. The humanity Stephen Crane incorporates while death and destruction are happening illustrates the craziness of war and the candidness of regular soldiers at the end of the nineteenth century. The dialogue reminds me of director and writer Quentin Tarantino of Pulp Fiction fame and the way he incorporates dialogue between action sequences.